The job of a caregiver can be unpredictable and stressful. One of the most important considerations for maintaining a healthy lifestyle comes with managing that stress. Caregivers have several options when it comes to stress relief: meditation, exercise and sleep all contribute to wellness. For caregivers with Apple phones, the built-in Health app automatically tracks steps so caregivers can gauge their daily activity. You probably don't realize the number of steps that you take each day. For caregivers especially, who might be crossing a room several times a day to get things for their senior clients, 15 steps here and 20 steps there add up fairly quickly. The Health app uses GPS data to track how far your phone moves, and with it, how many steps and miles you walk in a day. Caregivers with Apple phones don't even need to download anything to use this function; it comes pre-installed on the phone and tracks movement automatically. When caregivers open the app, they are greeted with a dashboard that shows the number of flights of stairs climbed, number of steps and walking + running distance average for the week. If caregivers also have a device such as a Fitbit that tracks calories and other fitness data, they can connect that with the Health app to produce more data, such as exercise minutes or workouts. For each category presented, caregivers can click to see more historical data and compare charts over time. For example, clicking on walking + running distance will show all of the daily data for the week, month or year and display bar graphs across the top to illustrate the data. It will also show your average distance overall. The comparison charts help caregivers realize when they might have a week or month that's particularly low so that they can adjust their routine to add in more exercise. Consider setting a daily step or distance goal for yourself, or maybe even for you and your senior client if they feel like going for a walk. For senior clients, regular movement helps keep their joints active, even if it's just a leisurely stroll around the block. For senior caregivers, walking or running even an extra mile every day can help relieve stress. The Health app comes pre-installed on all Apple products. Summer is almost gone, and with fall comes the tendency to spend more time indoors and sedentary. For senior caregivers, regular exercise can provide much-needed stress relief. Yoga offers a chance to get moving and improve flexibility while staying indoors. The Simply Yoga app teaches caregivers how to do complete different yoga exercises. When caregivers first open the Simply Yoga app, they will find a very basic home screen. One detriment to the app is the lack of labels on the home screen. Across the top, there are simply selections between 20, 40 or 60 minutes and underneath that numbers representing difficulty level. When users select a length and a difficulty number, the video program begins. The video introduces a pose by saying the name, describing the pose and how to effectively move your body to complete the pose. Poses in the program include Mountain Pose, Sun Salutation and Chair Pose. Users have the ability to move forward and backwards between the different poses using the buttons at the bottom of the screen, so if they miss part of the instructions they can listen again. In the background as the narrator talks, the app also plays background noise of waves in an ocean. This, along with the tone of the narrator's voice, is meant to help calm the user as they complete the exercises. In the settings area of the app, caregivers can turn this ocean waves sound on or off, as well as the pose sound and instructions sound within the app. The settings area of the app also offers a reminder day and time for notifications to complete a workout. Caregivers can complete these exercises in their living room, or with a senior client in their living room. Remember to use a mat, particularly if you should be exercising on a hardwood floor or a similar rough surface. For senior clients, yoga can offer a low-impact way to keep moving and improve flexibility. However, always check with their doctor before starting a new exercise plan and don't force any poses that might be too challenging for them. Participating in a yoga program together also gives you a chance to bond with your senior clients. The Simply Yoga app is available for Apple and Android platforms. While the interface itself leaves something to be desired in design, the videos themselves make for useful beginner educational tools. As the summer winds down into the upcoming Labor Day weekend, you may be asking yourself if you did everything you wanted to this summer. Did you spend time outside, enjoying some fresh air before winter rolls around again? The good news is that even if you answered, "no" to that last question, you still have time to get out and go for a hike using the Hiking Project app. Don't let the word, "hike" intimidate you. Some hikes could be considered more of a nice walk, depending on the elevation, ascent and descent throughout. For the flat hikes, a mobile senior caregiver could even join you for a short stroll to connect with nature a little bit. The Hiking Project app uses an actual map of your state to show areas where good hikes are available. Users can zoom in and out of different vicinities and see proposed hikes highlighted in green as they browse around. Once a caregiver picks an area they'd like to potentially go on a hike, they can click on the highlighted trail for more information. The details listed include: ascent, descent, high and low elevation, overall length and a photo. It also includes ratings from users, if available. A chart even shows the elevation compared to the length of the trail to give caregivers a visual representation of how challenging the walk would be. As users scroll down, they will find a detailed overview that lists hours, need to know information such as parking availability, further description of the trail including entrances, etc. Caregivers can check in at the trail within the app to keep track of which hikes they've already done, or add it to their To-do list to remind themselves to go there on a later date. Lists are also available to show the best hikes in your state, to help you choose if you have a few in mind. Going for a hike helps relieve caregiver stress. Consider an easy walk with a senior client to help get them moving enough to stay active and potentially prevent the onset of dementia. Then, put together a separate list of longer or more challenging walks that you'd like to go on yourself to relieve some stress. 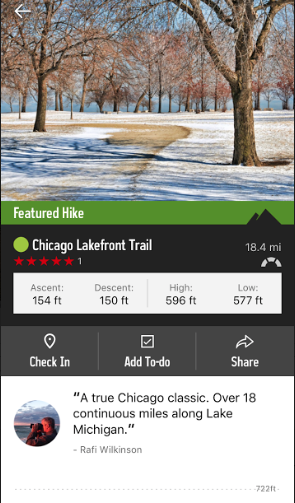 The Hiking Project app is available for Apple and Android platforms. Everywhere you turn these days, people are discussing how many steps they got today and if they've met the main goal of 10,000 throughout the course of their day. The FitBit craze has taken over. For senior caregivers who may not want to spend $100 or more on a wristband to count their steps, the MapMyWalk app offers an alternative to tracking light exercise. Going for a walk offers health benefits to senior caregivers and their clients alike. For senior clients who may not have ease of motion any longer and cannot participate in high-impact activities, walking provides a way to still get up and move while setting their own pace. For senior caregivers, walking can help get you out of the house and relieve stress. And, according to Harvard Health, as a form of moderate exercise, walking can improve cardiac risk factors such as cholesterol, blood pressure, diabetes, etc. When users first open the MapMyWalk app, they need to create an account. This allows caregivers to keep historical data of their walks to review and compare over time. Starting a new workout is easy. Caregivers simply need to click the "Record a Workout" button and make sure the proper exercise appears in the upper left corner. While the app's main focus is walking outdoors, other exercise types are available to track as well. Users can choose between stairs, walking on a treadmill, running, mountain biking, hiking and more. Once users select an activity, they can click the "Start Workout" button as they begin exercising. If caregivers don't have a specific route in mind, they can make it up as they go and the app will track it. Otherwise, if they'd prefer to have a set route ahead of time, the app offers a tool to see nearby routes that other runners have taken to help plan yours. For an additional fee associated with the MVP membership, users can use the Route Genius tool, which analyzes the map in your neighborhood and suggests the best path. As users go for their walk, the app tracks distance, duration, pace and calories burned. Don't think of this as a race against the clock, though. Take your walk at a pace that you feel comfortable with, especially if you have a senior client accompanying you. Once a workout is complete, it's stored in the workouts tab for future reference. Users can easily review how far they've walked over time on this tab. The app also features challenges that caregivers can opt into, if they so desire. These range in difficulty and requirements, such as walking a certain amount throughout the whole year. Users can also search for friends in the app to view their activity and send them encouragement. The MapMyWalk app is available for Apple and Android platforms. Arbor Day is next Friday, April 29. While the natural first inclination as a way to celebrate Arbor Day might be to plant a tree in your yard, caregivers and their senior clients don't have to go through quite so much physical labor to appreciate nature. Using the Oh, Ranger! ParkFinder app, caregivers can search local parks to enjoy with their senior clients as a way to get some fresh air, or on their own for hiking, biking or running as a form of exercise. After users first open the app and authorize it to use their location, they then have the option to search for parks based strictly on location, or instead select Things to Do at the parks prior to searching. Options on the Things to Do list include birdwatching, picnicking, hiking, fishing, boating, etc. Once caregivers select specific activities and initiate the search, a list comes back of all the parks in the area that meet that criteria. The app displays parks in a list, starting with the one closest to the user's current location and moving farther away as the list continues. There's also a map feature which allows users to see all the results plotted out, in case they'd like to find a park that way instead. Once users identify a park they might like to visit, they can click on it for a one or two paragraph description of the park in addition to a list of all the Things to Do there. The description tries to provide all pertinent information, such as the type of equipment at the park and the layout. One even shares information on whether the park is considered ADA accessible, which is helpful for senior caregivers whose clients might be in wheelchairs. The app only offers photos uploaded by other users who visited the park previously, so some of the parks have no photos at all. Caregivers can also read reviews left by other visitors to get an idea of what to expect when they visit, and leave their own review after they spend time in the park themselves. The last part of the park profile provides contact information for the park, including the organization who owns it (i.e. Chicago Park District) and the main phone number. Caregivers can check in when they visit the park to keep track of where they've been and save their favorite parks to the My Parks area of the app. Senior caregivers might find that spending just half an hour at a park with their senior client on the way home from an errand provides a nice way to stop and connect with nature. Running or biking outdoors at a park also offers a change of pace from regular gym equipment and some nice local greenery for added views. The Oh, Ranger! Park Finder app is available for Apple and Android platforms. Summer is right around the corner and with it comes the opportunity to get outdoors, enjoy the sun and get fit. Swimming offers an effective cardiovascular workout while being gentle on the joints. Senior caregivers and their senior clients can enjoy the activities together or senior caregivers can track time spent before or after work taking a few laps in the pool with the Speedo Fit app. The Speedo Fit app features swimming tracking and goals for beginners through advanced swimmers. When users first create an account, they set goals in the app for distance to swim. Beginners can choose to start off with a goal track called "Bathtub to 500m." It features weekly distance milestones that gradually increase until they hit the 500 meter mark. This may be a simple starting point for a more capable senior client or for caregivers new to swimming for fitness. The app also offers milestones and challenges for more experienced swimmers, such as "3K in 6 Weeks." The Gear section expands on what's needed to get started as a new swimmer. Since the app is put together by Speedo, the gear area offers users the ability to view products and shop directly in the app. Caregivers can also take notes on what's presented in the app and shop for the items at a store of their choosing. Senior clients can use the app primarily for different stroke demonstrations and adapt to swim at their own pace. Even light physical activity can help seniors maintain mobility. Caregivers can accompany them to the pool and spend a little time doing a few laps on their own to help with stress relief. The Speedo Fit App is available for Apple platforms. For senior caregivers, finding the time to go to the gym or for a run three times a week can be difficult. However, working out doesn't need to take up a lot of time and energy. Caregivers only need seven minutes for workouts using the Women's Health 7M Fitness app. When users first open the app, they are greeted with a basic home screen featuring a large start button and a menu underneath with Workouts, Calendar, Track Weight and More Apps. When users press the Start button, it launches them immediately into their first work out. Workouts consist of individual moves repeated for a certain amount of time, such as a No Rope Jump Rope, Squat Lunge or Mountain Climber. However, the pictures within the app showing during the workout don't always give the user the best sense of how to fully execute the move. Users ideally should spend time in the Workout button on the menu first to view individual videos demonstrating how to execute each move before they start their workouts. In fact, when users first begin using the app, it would be beneficial to spend the first session or two watching the video clips for each move and practicing them. That way, when caregivers are in the timed exercises they can spend time performing the move instead of trying to figure out how to do it correctly. When inside the timed workouts, a ticker counts down how long caregivers should spend on each exercise and a voice guides users through when to rest and which exercise is next. The workouts combine 10 moves to help women burn fat in what little time they have available. After users have begun to exercise on a regular basis, they can view the calendar to see which days the completed a work out and plan ahead for when to incorporate workouts in the upcoming weeks. The weight tracker component also allows users to enter their weight and see how it changes over time. The More Apps area offers similar apps for download from the same company, some of which target more specific fitness goals such as Fit Abs, Fat Burn or Arms. The Women's Health 7 Minute Workout app is available for Apple and Android platforms.